Antique Plant Stand / Pedestal Table / Jardiniere VTG 20s 30s 40s 50s Edwardian. Large size, exact measurements are on the pictures. Please see the pictures for details of the condition. Edwardian art nouveau jardiniere plant stand, wig stand. Mahogany wood with barley twist legs. Marble and Mahogony Wash Stand Edwardian . Lovely piece..simple in design With two doors and back stand of pale grey and white marble. 42ins long 20 deep 30 ins high 46 ins including back stand. This is a genuine antique ..it was my grannie's who married in 1915 so guess that's the date... Scratch on side and right door needs fixing.. I have the brass towel rails from the sides..
JARDINIERE PLANT STAND EDWARDIAN. GORGEOUS SHAPE AND MADE FROM A DEEP HARDWOOD - I THINK IT'S MAHOGANY. IT HAS A WATER RING TO THE TOP SURFACE AND IT HAS SUSTAINED A FALL IN THE PAST AND IT HAS BEEN REPAIRED - I WAS OK WITH THIS AS ONCE A POT WAS IN PLACE ON THE TOP AND IT WAS TURNED TO THE BACK IT WAS NOT AT ALL NOTICEABLE. It certainly has the look. Beautiful dog and tree motif. It is very large, and really very heavy! Quality construction. The semicircular tray is removable for ease when disposing of rainwater. Part of Highway Cycles, in Amwell End, Ware. I think the wood is mahogany - in good used condition as shown. Lovely small book rest or book stand with adjustable table. It is made from solid wood not veneered. A small piece of wood (1/2") has been replaced along top edge of 'table' - visible on inside open view photo. Unique Stylish Edwardian Plant Stand. Lovely Elegant Grey Painted Edwardian Cakestand C.1910. super Art Nouveau styling. 89 Wide x 32 High. Made about 1900 in the Arts and Crafts style of a miniature Dresser and in good used condition in its original naturalcolour and polished finish. Note slight shrinkage to back board, see photos 3 & 9. This is an Edwardian Mahogany marble top for a washstand or dressing table. It is tiled backed with a mirror on the top. In total width it is 106cm and 50cm in depth. The mirror is 47cm in height, 28cm in width. 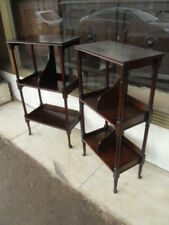 Good quality mahogany torchere / plant stand in the Chippendale style circa 1900. If you would prefer to collect yourself that is fine by us. 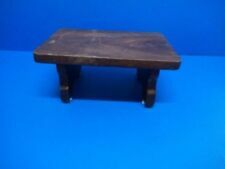 PRETTY EDWARDIAN INLAID MAHOGANY FOLDING TABLE CAKE STAND _ priced to sell! PRETTY EDWARDIAN INLAID FOLDING CAKE STAND IN VERY GOOD CONDITION. DUE TO PEOPLE NOT TURNING UP I CANNOT ACCEPT CASH ON COLLECTION. Edwardian adjustable shop display stand. Cast iron base. From 31 to 51cm to t bar. 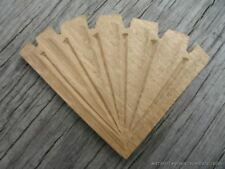 Probably Edwardian, mahogany quarter cut veneer, folds down so can stand against a wall, very versatile, ideal for afternoon tea or for display purposes. Overall height approx 31" and width 20". FOLDING TEA TRAY. Classic Edwardian Bentwood hat Coat & stick stand c.1920. This piece had been previously painted in the 1960’s by its original owners and had remained in a dry attic until its recent unveiling. Now repainted in an updated light Grey, Farrow & Ball Hardwick White Low Sheen Eggshell which would sit graciously in any traditional or contemporary Interior. A lovely Edwardian circular oak hall stand, c1920s. Made of oak with tapered supports, rotating top with finial and 5 brass hooks, centre section with finial and 3 brass hooks, umbrella stand with original drip tray. Genuine Antique Edwardian hat & coat stand with mirror. Also has area to place umbrella's.